Note that you do not need a Kindle to read ebooks. Kindle books can be read on any Kindle device, on iPhone, iPad, PC, Mac, Android device, BlackBerry, and Windows Phone 7, and through the Kindle Cloud Reader. Ancestor Death Record Finder: Tips on Finding a Death Record When You've Hit a Brick Wall available as an Ebook or paperback. 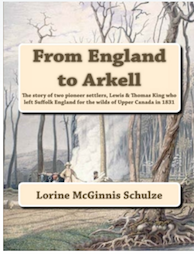 From England to Arkell: The story of two pioneer settlers, Lewis & Thomas King who left Suffolk England for the Wilds of Upper Canada in 1831 A Genealogy to 4 Generations following their descendants in Ontario, Alberta, Australia & Michigan. This book follows 4 generations of descendants of George Wildbore and his wife Alicia Pamphlett (nee Sackett) who married in Minster, Thanet, Kent England in 1571. Isaac Hubbard married the widow Mary Ducy in St. James in Dover in 1698.This book follows Isaac and Mary's descendants down four generations through their son Isaac, their grandson Philip, their greaat-grandson Philip and their great-great-granddaughter Milly Elizabeth who married John Caspall. The Hinds families were in Ramsgate Kent England for many generations. This book follows the descendants of Thomas Hinds and his wife Sarah Ammis who married in 1693 in Canterbury. The surname is found in records as Hinds, Hind, Hindes, Hinde, Hynds, Hynd, Hyndes, and Hynde. Family group sheets are included as are images of all documents found. The Laming family is found in Thanet and Minster Kent England for over 200 years. This book follows six generations of descendants of William Laming born circa 1610 and his wife Mary Culmer. The Caspall family can be found in Kent England with John Caspall's birth circa 1710-1717. This book follows the descendants of John Caspall and his wife Mary Prigg for six generations. John was from Stonar Kent but he and Mary baptized all their children in Sandwich Kent. Other locations where Caspall families lived include Folkestone and Ramsgate. This book follows two distinct Norris families in Kent England. The first is the Norris family found in Lenham Kent in 1773 when Edward Norris and Catherine Earl were married in the Lenham parish church. Four generations of their descendants are followed. The second is the Norris family of Elmsted and Waltham Kent. This family was in Elmsted in 1680 when John Norris was baptised in St. James the Great church. By the time of his marriage to Mary Carr in 1710, he had moved to Waltham. His descendants are followed for three generations. Documents and family group charts are included. The three brothers Hendrick Meesen Vrooman, Pieter Meesen and Jacob Meesen came from the Netherlands who came to New Netherland in the early part of the 17th century. Pieter arrived circa 1655, and he and Jacob settled in Albany. Hendrick settled first at Kinderhook, then Steen Raby and finally Schenectady in 1677. 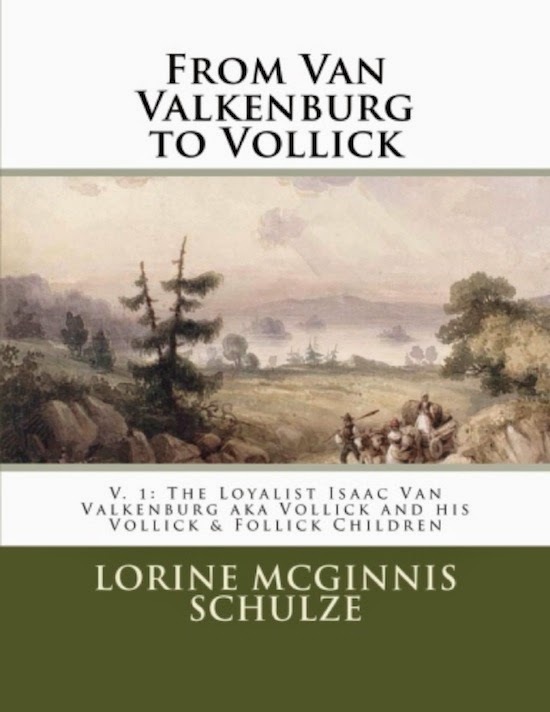 This book traces the Vrooman ancestry back to the brothers' great-great grandfather Gerrit Jans Kerstantsz born in Holland circa 1457, and follows the family down 5 generations. The Dutchman Adriaen Crijnen Post and his wife Claartje (Clara) Moockers are found in Recife Brazil in 1646. By the time Brazil fell to the Portuguese in 1654 Adriaen and his femily had left for the Netherlands. From there they sailed to New Netherland. 30+ years of research pulled together. This is the 3rd Edition of my Van Slyke book. 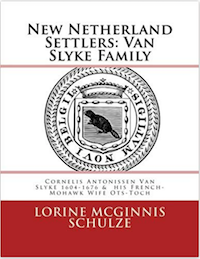 "New Netherland Settlers Van Slyke Family: Cornelis Antonissen Van Slyke 1604-1676 & his French-Mohawk Wife Ots-Toch"
My husband and I were looking into my father's paternal line today. Leslie Daniel Vollick. My father died at 43. My mother, Ada Carnese Smothers Vollick, died at 32. 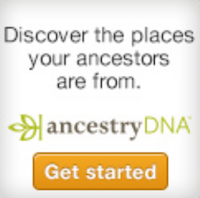 I discovered your site this evening after searching back through heritage.com. to find Isaac Van Valkenburg. That was the end of the trail till I found your site. This is very interesting to me. There is enough information to write a book about it. That is wonderful-- I hope to get your books and find out the whole story.